American rabbi and author; born at Vienna, Austria, Feb. 24, 1863; educated at the University of Cincinnati (B.A.) and at the Hebrew Union College (D.D.). Grossmann is descended from a family of rabbis. In 1884 he became rabbi of the Temple Beth El at Detroit, Michigan, retaining this office until 1898. He then succeeded Isaac M. Wise as rabbi of the Congregation B'nai Yeshurun at Cincinnati, and also as professor of theology at the Hebrew Union College. 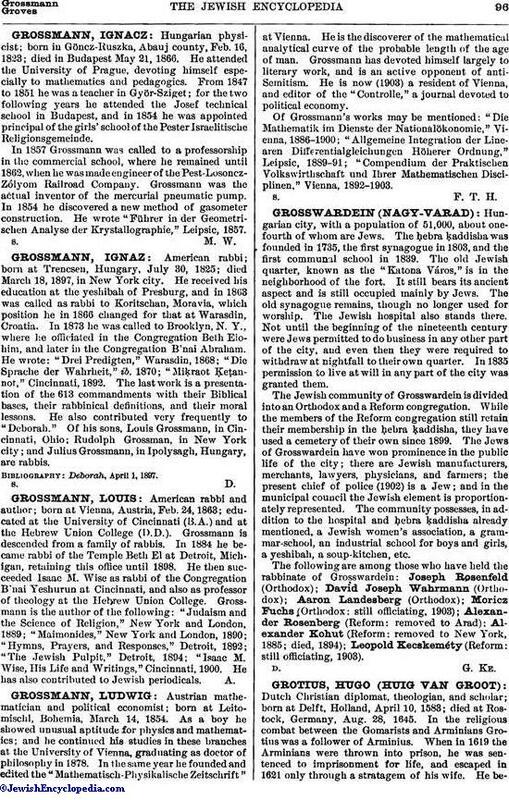 Grossmann is the author of the following: "Judaism and the Science of Religion," New York and London, 1889; "Maimonides," New York and London, 1890; "Hymns, Prayers, and Responses," Detroit, 1892; "The Jewish Pulpit," Detroit, 1894; "Isaac M. Wise, His Life and Writings," Cincinnati, 1900. He has also contributed to Jewish periodicals.